As promised, here is part XI of the continued Munich series. Communal grieving was something that was prominent in the immediate aftermath of the Munich disaster. Public funerals were commonplace. Nobby Stiles, a member of the youth squad, remembered how ‘all he seemed to be doing for weeks was going to funerals. He even served on the altar at the requiem masses’. David Hall recollected the story of one fan, 54 year old David Bunn, for whom the funerals and tragedy became too hard to bear, as he stabbed himself to death in a state of manic depression soon after the accident in February. 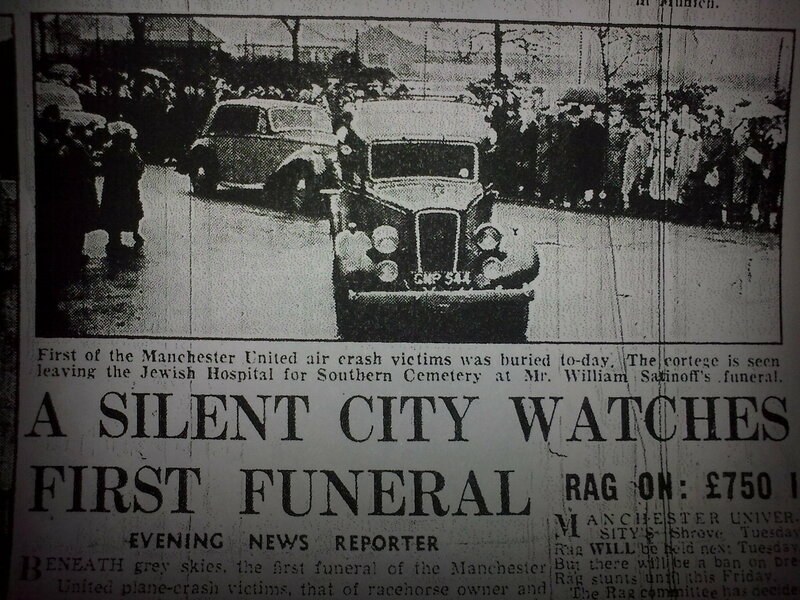 Willie Satinoff’s public funeral was the first of these in Manchester. Willie, who died in the Munich disaster, was a Jewish businessman from Manchester who owned a factory in Strangeways, Greater Manchester. Jewish mourners and others came together from all across the country to grieve at the procession of 60 cars for this funeral, ‘many workers, both past and present, watched silently outside as the cars past’. The first game following Munich was Manchester City against Birmingham on 15 February 1958. It was a sombre affair from the start with the Beswick Prize Band’s rendition of Abide by Me before kick-off setting the tone. With an attendance of 23,461 in a season where the average attendance was 32,765, it summed up the general attitude of the public. In the face of this adversity, football seemed trivial to watch. Seemingly everybody in Manchester knew someone that died upon the plane in Munich, such was the impression of an entire city grieving. City Chairman Eric Alexander once described how ‘it affected everybody in Manchester…we all lost something that day’. Manchester Guardian football writer Donny Davies was the head teacher of Mather and Platt’s apprentice school, and was one of the journalists who died on the plane. Alan Crookhall, an employee at Mather and Platt’s factory at the time remembered vividly how ‘you could hear all the machines all over the factory going off until the whole place was silent. Nobody could believe what had happened. The series is coming to a close with only a few entries left. The next piece will take a look at how modern day memories of the Munich Disaster and how they vary from those in the past. Time has certainly altered the image of the disaster in Manchester with the emergence of fan tribalism causing a rift in the use of it’s memory.